I feel the need to preface this thought, for some reason. What I am writing is something that has been stirring in my brain and I hope that it can hopefully help someone. About 2 months ago we had our adult leader meeting. We try to do these every 6-8 weeks where the leaders get some time to hang out and just connect. I then take about 30 minutes to share my heart. At this particular meeting I shared about the need for us to have roles that we all fit into. I have felt our leaders not feeling like they have a, “job,” something that they can own on Wednesday nights. After the meeting, which I thought went great, I was really excited to see the buy-in level increase and leaders plug in more. It seemed like neither of those things happened. All of that said, it got me thinking about what I call the investment mindset. I don’t know if you have a 401K or not, but I feel like my retirement is similar to investing into students (you may think I am crazy right now, but keep reading). Every paycheck I get, 26 a year, I ask my church to take out a set amount and invest that into my retirement. I don’t, “see,” that money so I just tell myself that I never got it. I don’t really miss it cause I never really “see” it. Then twice a year I get a statement in the mail that makes me wonder why I keep putting that money in there. I open it up hoping that, for some unknown reason, my retirement will be huge… but it’s not. Then I have to remind myself that this investment will take time to mature. That is exactly how I think many of us feel about working with students (and our leaders feel the same way too). How many countless nights have you sat with a student listening to their problems, counseling them, sharing scripture with them and praying with them to only see them make the same mistake? Or what about the time it takes to make camp happen and all the hours you put into it, then you have to leave your spouse for the week and you just wish you could see them. Think about the last mission trip you went on. How amazing was it or is all you can think about is how tiring it was? Does it ever feel like some of this is worthless? We have all been there. See student ministries is just like my 401K. It would be nice to have that time or money right now. Sometimes the sacrifice doesn’t look like it will pay off in the end, but we need to keep reminding ourselves that what we do is so worth it! If someone hasn’t told you that in while just think about the students you work with that will never forget you, trust me, they will never forget you and the constant time you put into their lives. The investment is worth it! So we just had the appointment and got the final word that BB is a girl. We were told at 15 weeks that BB was 90% a boy. We went back at 18 weeks and saw nothing (by the way, our doctor is rad and does an ultrasound every appointment). For the 21 week visit BB had turned into a girl... WHAT??? Are you sure? 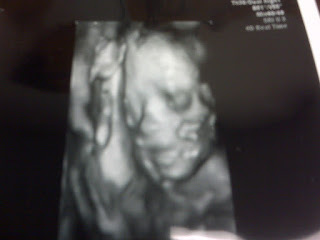 Then we just went back on tuesday and its for sure... BB is a girl! I'm gonna be a dad. So many thoughts to hit my mind. Today I am working on HW for my Greek class. We are translating the book of Ephesians and I am just in awe right now of the power of God's word. It is so easy, I think, for us to read the Bible and just take certain words for granted. When I have to look at the words and sentence structure in Greek it gives me such a deeper appreciation for Gods word. Next time you are reading, take it slow and ask God to show you what He wants you to learn, I think you will like it!